First Listen: Fiona Apple, 'The Idler Wheel...' On her first album in seven years, Apple explores difficult emotions in unexpected ways: by saying no to simple beauty and instead expressing the urges and insecurities that more accommodating artists tend to avoid. Fiona Apple's new album, out June 19, is titled The Idler Wheel Is Wiser Than the Driver of the Screw and Whipping Cords Will Serve You More Than Ropes Will Ever Do. Emotions are so darn beautiful — that's the message of music, much of the time. The giggling lilt of a melody, the ennobling swell of a crescendo: Popular songs, especially, often enhance our moods to lift us up, unbreak our hearts, drive us toward liberating confessions and cathartic climaxes. Courting the sublime so aggressively that it often gets ridiculous, pop music encourages listeners to imagine feeling in ways that make us bigger, better. 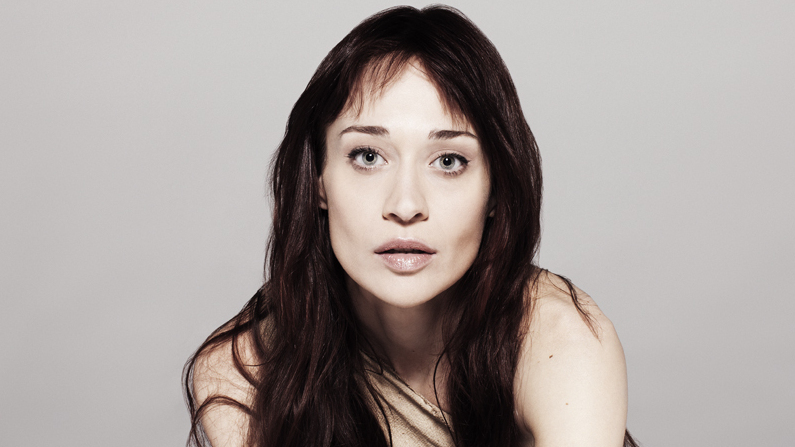 Fiona Apple's music does something different. A classically lovely woman whose gorgeous, sultry alto once led her toward alt-divadom, Apple has always dared herself to be and do something else: to say no to simple beauty and instead express the urges and insecurities that more accommodating artists tend to avoid. This has never been truer than on Apple's first album in seven years, whose typically hard-to-digest title is partly The Idler Wheel — the part in a system of gears (on phonographs and cassette players, among other extraordinary machines) that, seemingly passively, helps other parts move. The feelings Apple takes on in her deliberately maddening, eventually addictive new songs are those that inch us along, filling up most of our lives: icky little feelings like petty jealousy, self-doubt, bored loneliness and shamed regret. This is the stuff we'd rather tamp down. Apple wraps her fingers around it and makes it unavoidable. The woman who sighs and yells and moans and twists her voice into unattractive shapes on The Idler Wheel is one who, by conventional standards, thinks and feels too much. She's the kind whom others want to shut up, but she keeps resurfacing — in the poems of Sylvia Plath, the stories of Lorrie Moore, the films of Lynn Shelton and Miranda July. These are Apple's peers, more than most singer-songwriters, though her uncompromising flow recalls Tori Amos and her sense of humor (as a friend who's a major Fiona Apple fan pointed out to me) is a lot like Leonard Cohen's. In the lyrics for songs like "The Periphery" ("They throw good parties there"), "Left Alone" ("I went to work to cultivate a callus") and "Valentine" ("You didn't see my valentine / I sent it via pantomime"), Apple goes where those literary types go, obsessively focusing on everything that's not a Kodak memory. This is not pretty stuff, nor is it spectacularly tragic or horrifying. On The Idler Wheel's first single, "Every Single Night," Apple describes what she's trying to capture as "the flight of little-wings of white-flamed butterflies in my brain" — a striking image that turns disturbing when you think about what it's like to be enveloped by trapped, flapping tiny insects. The cultural theorist Sianne Ngai has dubbed these affects "ugly feelings" — "amoral and noncathartic, offering no satisfactions of virtue, however oblique, nor any therapeutic or purifying release." Ngai compares them to "rats and possums, rather than lions," beasts that menace in unglamorous ways. Ngai's notion of ugly feelings perfectly suits the sonic palette of The Idler Wheel. Working almost exclusively with drummer and multi-instrumentalist Charlie Drayton — bassist Sebastian Steinberg also appears, and Apple's sister Maude Maggart sings high harmonies in "Hot Knife," a remarkable account of sexual craving — Apple uses her piano as a percussive instrument that also makes melodies. She bangs at it, slapping out chords that sometimes feel like marching orders and sometimes act as interruptions, enhancing the stop-start nature of her internal monologues. Don't think of this as sloppy: Apple takes care in her jagged process, and seasoned session man Drayton, whose impressively empathetic drum work often takes the lead, is a subtle challenger who never lets Apple drift into a rut. The two musicians augment their core dialogue of drums and piano with a grab bag of fun stuff listed in the album's liner notes, including loops, marimba, celeste, bouzouki, pillow, "teised guitar" (whatever that is) and thighs. It's not new for Apple to play around with unusual instruments — she worked with the master of that game, Jon Brion, for years — but this work feels more exploratory and improvisational. The same is true of Apple's singing. She doesn't simply push herself vocally; she embraces the role of the contortionist, the strange expression, the note that might make someone turn away. She also sings beautifully at times. It's a mix, reflective of the tangle she's trying to unravel — thought itself. "I don't want to talk about, I don't want to talk about anything," Apple mutters and pleads as Drayton clatters cymbals and snares behind her in "Jonathan," a burst of anger and desire directed at her former lover, the writer Jonathan Ames. But, of course, those who love her do so because she talks about everything. "I like watching you live," she growls at the man who seems to have turned away. It's a joy to hear her live, in all her willful unprettiness.